The whole point of the idiot who wrote this article was that cheap gas is caused by a poor economy, not more production as promised by Michelle Bachmann. Well, he was wrong and Bachmann was right. We now have an economy that isn't in recession and low oil prices precisely because of increased production. So Bachmann has promised to bring gasoline below $2 a gallon — a 56% decrease from the current average price of $3.58 a gallon. Now, there are a few things wrong with this. 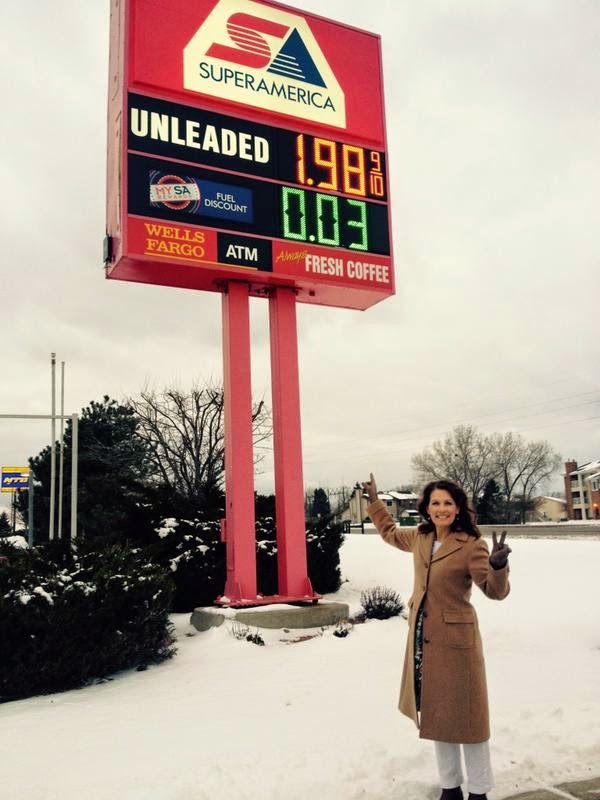 For one, the $1.79-a-gallon figure that Bachmann cites is from December 2008, before Barack Obama actually took office. (When Obama was inaugurated, gas cost $1.81 — not a big difference, I know, but how hard would it have been to get the right figure? The data are right here.) More important, though, is the reason that gas was — comparatively speaking — so cheap a few years ago. It wasn’t because the U.S. was suddenly pumping more oil, or because the Saudis had decided to flood the market, or because the head of ExxonMobil lost his mind and started to give all Americans a 2-for-1 deal on gas. The U.S. — and the world — was in the depths of the worst recession since the 1930s, depressing demand for everything from data centers to electricity to driving. It’s Econ 101: precipitous falls in demand usually trigger precipitous falls in price, which is what happened to gas prices, dropping from a high of $4.05 a gallon in mid-July 2008 to a low of $1.69 a gallon at the end of December that year. If you see sub-$2-a-gallon gas again, I strongly suggest that you stock up on bottled water and canned tuna, because the economic end times may be at hand.